In November, Pamper your Pooch came to us for responsive ecommerce design website. They wanted a whole new branding and responsive ecommerce design for their start-up company. The client sells a wide range of dog products from funky designer dog clothing to flashy diamante collars and leads. 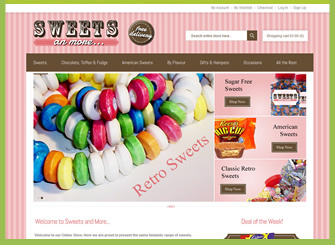 They wanted a very easy to use shopping site that would allow them to grow a customer base with a personal touch. We are over the moon with our new website and company branding. As a start-up company we did not have a very large budget so finding a company like Unltd Ecommerce, who can put such an amazing website together for us for just £50 per month has really made our business complete. Thank you Unltd Ecommerce, we would definitely recommend you to anybody else wishing to sell their products online. One of the main things we discussed with the client was usability. The client was very aware that mobile commerce is already taking a billion pound share out of the online sales market. With this in mind we created a fully responsive ecommerce design that automatically displays an easy to view version for all different platforms. Be it desktop, tablet, mobile phone (and even the older creaky browsers!). This has proved to be an instant hit for Pamper your Pooch as they are already receiving over 30% of visitors from mobile devices. We are pretty sure that if the site had not been designed in this responsive way they would not have turned any of these visitors into sales. The package we put together for Pamper your Pooch is stacked full of features to make their customers browsing experience a memorable one. From stunning sliders on the homepage through to multiple zoom-able images on the product pages, the visual side of the website speak for itself. On the back-end we have an easy-to-use content management system that allows the client to add their own products, add articles, special offer codes and amend the overall look of the homepage. We have made this system as easy to use as possible and also included some basic search engine optimisation training to help the client give their business the online push it needs to get a good customer base. This has already paid off with over 100 like to the Facebook page on the day of launch. The corporate branding for this client was greatly received by the client, they are so happy with the logo they having it printed a range of merchandise which will soon be available from the website alongside their other products.